1910 PCUSA General Assembly, Atlantic City, NJ. Image No. 4668. Millions of Americans identify themselves as Christian fundamentalists. The size of the fundamentalist movement and the participatory zeal of many of its adherents allow it to shape national conversations over issues such as marriage, education, and foreign affairs. Fundamentalists exert huge power in nominating and electing public officials, including presidents. The term “fundamentalism” entered the American lexicon thanks to two Presbyterian brothers from Titusville, Pennsylvania: Milton and Lyman Stewart. 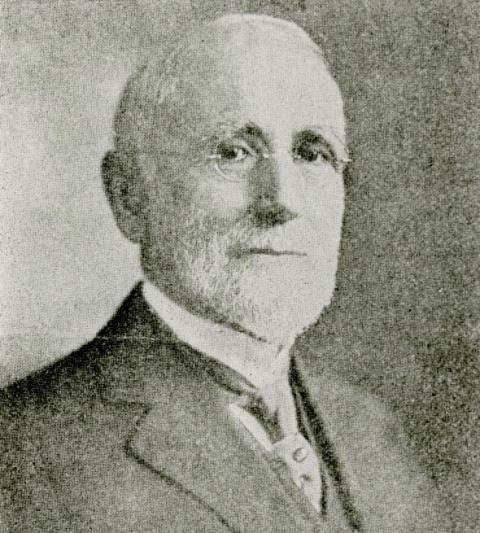 Lyman Stewart helped found the Hardison and Stewart Oil Company, which later became the Union Oil Company of California. The oil business made Lyman and Milton millionaires during the late nineteenth century. Lyman Stewart, 1924. Image No. 4657. While a member of Immanuel Presby­terian Church in Los Angeles, Lyman became swept up in the burgeoning fundamentalist movement. During the 1894 Niagara Bible Conference, which was led by Presbyterian minister James H. Brookes of Washington Avenue Presbyterian Church in St. Louis, Lyman donated $1,000 towards the publication of Cyrus I. Scofield’s Reference Bible. Considered by many to be the most influential fundamentalist publication ever written, the Scofield Reference Bible divides history into seven dispensations eventually leading to a tribulation and millennialism—a 1,000 year reign of Christ. Within two years of publication, two million copies of the Reference Bible were sold. The Stewart Brothers made another significant contribution to the fundamentalist movement when each gave $150,000 to help A.C. Dixon and the Testimony Publishing Company publish The Fundamentals: A Testimony to the Truth. The Fundamentals, from which the term “fundamentalist” comes, included ninety essays divided into twelve volumes. Published from 1910 to 1915, its sixty-four contributing authors representing the major Protestant denominations from the U.S.A., Canada, and Great Britain defended the orthodox view of Scripture. According to Bradley Longfield, author of Presbyterians and American Culture: A History, more than a third of the American writers in The Fundamentals were Presbyterian. In the preface to the last volume of The Fundamentals, the Stewarts wrote that close to three million copies had been published to date. 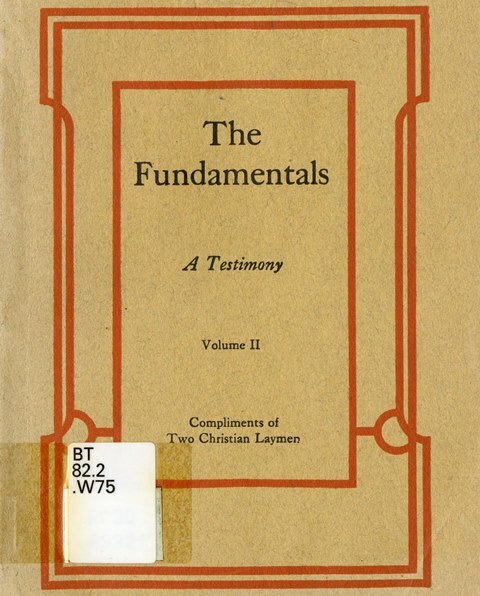 The Fundamentals: A Testimony, "Compliments of Two Christian Laymen," n.d. Image No. 4656. Presbyterian involvement in the fundamentalist movement was hardly limited to the Stewart Brothers or James H. Brookes. The Presbyterian Church in the U.S.A. (PCUSA) was the first denomination to articulate key fundamentalist principles. After passing its five points for ordination, the 1910 General Assembly adopted three other fundamentalist-inspired resolutions: (1) all candidates of the ministry agree to these five points, (2) parents and teachers must share the word of God with children, and (3) “all our pastors and Presbyteries take action to have read aloud in our churches and judicatories this doctrinal declaration of the General Assembly.” The “Doctrinal Deliverance” of the 1910 General Assembly would embolden the conservative elements who wanted to protect the denomination from a looser, more liberal view of scripture. The General Assembly reaffirmed the five fundamentals again in 1916 and 1923, suggesting that fundamentalism was the prevailing movement within the denomination at the time.